The search for a "patient zero"—popularly understood to be the first person infected in an epidemic—has been key to media coverage of major infectious disease outbreaks for more than three decades. Yet the term itself did not exist before the emergence of the HIV/AIDS epidemic in the 1980s. How did this idea so swiftly come to exert such a strong grip on the scientific, media, and popular consciousness? 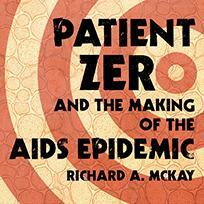 In Patient Zero, Richard A. McKay presents a carefully documented and sensitively written account of the life of Gaétan Dugas, a gay man whose skin cancer diagnosis in 1980 took on very different meanings as the HIV/AIDS epidemic developed—and who received widespread posthumous infamy when he was incorrectly identified as patient zero of the North American outbreak. McKay shows how investigators from the US Centers for Disease Control inadvertently created the term amid their early research into the emerging health crisis; how an ambitious journalist dramatically amplified the idea in his determination to reframe national debates about AIDS; and how many individuals grappled with the notion of patient zero—adopting, challenging, and redirecting its powerful meanings—as they tried to make sense of and respond to the first fifteen years of an unfolding epidemic. With important insights for our interconnected age, Patient Zero untangles the complex process by which individuals and groups create meaning and allocate blame when faced with new disease threats. What McKay gives us here is myth-smashing revisionist history at its best. Richard A. McKay is a Wellcome Trust Research Fellow in the Department of History and Philosophy of Science at the University of Cambridge.